What Will Be Different After This Campaign? 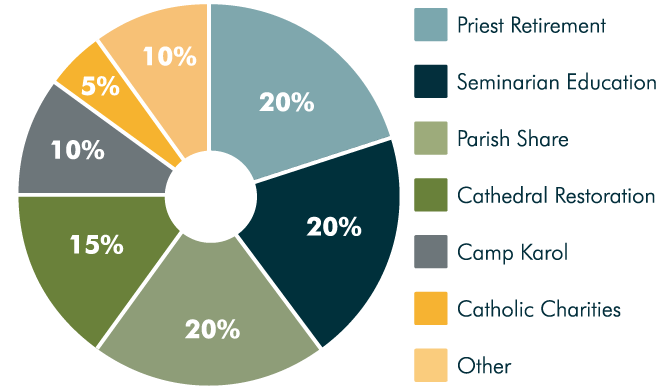 • Our Priest Retirement Fund will be in a stronger position to help provide a dignified retirement for our priests. • We will increase our ability to ensure a vocation to the priesthood is an affordable option for quality young men called into the Lord’s service. • Our parishes will have invested in their facilities and programs to improve the quality of everyone’s Catholic experience. • The foundation and symbol of our faith in this region, the Cathedral of the Immaculate Conception, will be strengthened and fortified to stand proud and vibrant for another 100 years. • We will construct Camp Karol of Saint Charles Center in order to have the ability and resources to pass on a dynamic faith to our children for generations to come. • Greater Southwest Louisiana will witness our faith in action when we better answer Jesus’ call to serve those most in need in our communities. • Want to know more about Return to the Lord? Click here to learn more. Other: 10 percent of the campaign funds will be marked for “unfulfilled intentions” – those pledges that are not 100 percent fulfilled within the pledge period. This ensures that funding to all other campaign goals will not be reduced. Additionally, it will provide the costs of running the campaign, which involves design of all the marketing materials, printing, postage, professional assistance, grant writing, travel, meals and events. Bishop’s Guarantee: Any funds raised over the $16 million goal that are not designated to a specific program will be allocated by the bishop and Diocesan Finance Council to the area of the campaign where the need is greatest. Campaign funds will not be used for anything beyond what is set forth in this document.